Lincoln Andrew Storms, precious baby boy of Travis Storms and Ana Vasquez, was born into the arms of angels at 1:22 p.m. on Friday, September 14, 2018 at Mercy Health St. Vincent Medical Center, Toledo, Ohio. Lincoln was born at 41 weeks, weighed 6 pounds, 2 ounces and was 19 inches long. Although he was never able to spend time with us on Earth, he touched many lives and will be cherished forever. Lincoln was blessed with loving and caring parents, a big brother, Xavier Storms; maternal grandparents, Claude and Dawn Bennett, Lily, Kentucky; Osiel and Selenia Vasquez, Sr., Hamler, Ohio; paternal grandparents, Wayne and Ginger Storms, London, Kentucky; maternal great grandmother, Shirley Adkins, Hamler, Ohio and many loving family members. Lincoln was welcomed in heaven by his maternal great grandfather, James "Roger" Adkins. 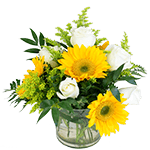 Arrangements were entrusted to Feehan-Rodenberger Funeral Home, Deshler, Ohio.